We spend many hours each day in our homes - awake and asleep. Doesn't it make sense to make investments that will improve the quality of the air you breathe inside your hame? This article will discuss products that are available to improve the quality of your indoor air. These products can be found on IAQSOURCE.COM . Indoor air pollution sources release particles and pollutants into the air. If too little outdoor (fresh) air is brought into the living space, these pollutants can concentrate to levels that are unhealthy. In the very cold months of winter and very hot months of summer - folks usually have all their windows closed. With no fresh air coming into a home - and inadequate air cleaning - problems are bound to surface. There are many sources of indoor air pollution in any home. These include combustion sources such as oil, gas, kerosene, coal, wood, and tobacco products; building materials and furnishings as diverse as deteriorated, asbestos-containing insulation, wet or damp carpet, and cabinetry or furniture made of certain pressed wood products; products for household cleaning and maintenance, personal care, or hobbies; central heating and cooling systems and humidification devices; and outdoor sources such as radon, pesticides, and outdoor air pollution. In addition to these pollutants is particulate matter that might manifest itself as dust. Dust you can see really represents only the largest particles in the air. 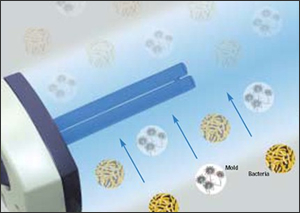 Other submicron particles may also be present like pollen, mold spores, dust mite debris, pet dander, fine construction dust, etc. Portable Air Cleaners - do they work? If it is impossible to change the central, whole-house air cleaning system - or if you live in an apartment where you don't have access to upgrade your whole house filter - a portable air cleaner may be the answer for you. The obvious disadvantage of a portable air cleaner is it's limited scope. Portable cleaners will do a good job of cleaning a small area or a single room but cannot create clean air in the entire home. Furnace and AC Filters - they're already there, upgrade them! In the mechanical room in most homes, you will find the 1" furnace or air conditioning filter. 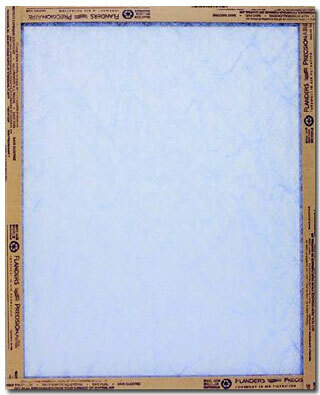 It is likely to be the cheap, fiberglass filter you might see at a local hardware store. All air that is heated and cools passes through this filter before entering the living space through the supply ducts. The purpose of these cheap filters is to product your heating and cooling equipment - not necessarily to clean the air that you breathe. It 's an easy task to spend a few extra dollars and upgrade to a pleated filter - which is more efficient at removing small particles. Change your 1" furnace / AC filter at least once every three months. In this part of this article - we will begin talking about products that may require professional installation or duct re-work. A relatively simple upgrade from the 1" furnace / AC filter slot would be a whole house air cleaner installation. A whole house air cleaner resides in precisely the same location as the 1" filter - but is usually much thicker/larger. Because of this - a transition may have to be built to accomodate the air cleaner. The extra size of the air cleaners means a deep pleated filter can be used - usually with more efficient media and much higher dust holding ability. Simply stated - a deep pleated air cleaner filter will do a better job of cleaning the air and will last longer - sometime up to a year between filter changes. A media, or mechanical air cleaner is simply a large cabinet housing for a deep-pleated filter - usually 4"-6" in thickness. Though no more complicated to make room for than the mechanical cleaners above - an electronic air cleaner uses electricity to attract and remove particulate. Some electronic cleaners like the Aprilaire Model 5000 use both a media cleaner and electronic components. An electronic air cleaner uses an electrical charge to trap particles travelling in the air stream. On paper, an electronic air cleaner should be roughly 10X more effective than a media/mechanical air cleaner. We find that customers tire of cleaning the electronic components and prefer to use a disposable filter. With "tighter," more energy efficient homes - the quality of indoor air has declined dramatically. The air circulating in the ductwork of the average home or office can be concentrated with contaminants including molds, bacteria, and viruses. Basic filtering systems offer little help because these airborne contaminants either pass through a filter or collect on filter medium and grow. 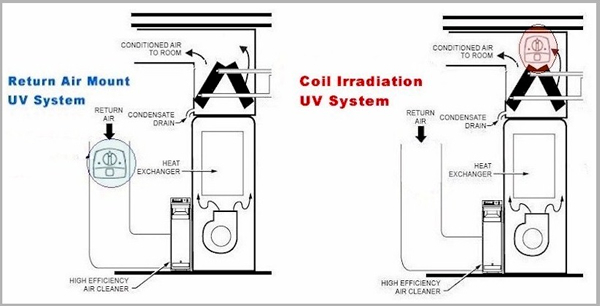 Ultraviolet light can help fill the indoor air quality gap and clean the contaminants in the air that filters can't. ndoor air quality problems have soared since the late 1970's when construction technology succeeded in developing energy efficient "tight" houses. Heat recovery ventilators have long been popular in Canada and are becoming popular in the USA. In fact, Canada has a national ventilation law. In 1992 there were more than 125,000 units sold there. In the U.S., there are three states which have ventilation laws and there are more than 15,000 units currently in use in the USA. Pollutants inside houses, which once escaped through cracks around windows and doors, are now trapped inside creating an indoor environment that is often 2 to 5 times more polluted than outside. Pet dander, mold spores, dust mites, allergens, tobacco smoke and other pollutants add up to poor indoor air quality. An ERV (Energy Recovery Ventilator) or an HRV (Heat Recovery Ventilator) is a great way to fight poor indoor air quality by bringing fresh air into the home while also expelling stale air. HRVs and ERVs use internal fans to pull fresh air in and move stale air out of a home. The key to efficient ventilation is the HRV or ERV core - which heats or cools incoming fresh air, recapturing 60 to 80 percent of the conditioned temperatures that would otherwise be lost. HRV vs. ERV - what's the difference? There are two types of energy-recovery systems: heat-recovery ventilators (HRV) and energy-recovery (or enthalpy-recovery) ventilators (ERV). Both types include a heat exchanger core, one or more fans to push air through the machine, and some controls. The main difference between a heat-recovery and an energy-recovery ventilator is the way the heat exchanger core works. 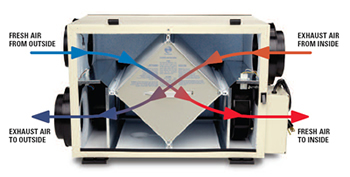 With an energy-recovery ventilator, the heat exchanger transfers a certain amount of water vapor along with heat energy, while a heat-recovery ventilator only transfers heat. The part of the country in which you live will dictate that type of unit that is right for your needs. Generally speaking - HRVs are usually recommended for colder climates with longer heating seasons. ERVs are used for warmer, more humid climates with long cooling seasons.